I love sweet treats. I usually eat really healthy, but put a dessert in my vicinity and I am in trouble:) Teanna, from Spork or Foon always entices me with her amazing photos of sinfully delicious baked goods. When I saw her Self Frosted Cupcakes, I knew I had to try them. I heart Nutella. I could eat it by the spoonful. I try not to buy it because Josh is allergic and I really don’t need it. After reading Teanna’s post, I decided it was time for a splurge. I love bananas and nutella together, so I thought I would try a little spin off from the Self Frosted Cupcakes. I made a banana cupcake with a Nutella swirl. I also made them in my mini muffin pan, for cuteness factor and portion control. :) I thought swirling the Nutella would be a pain in the rear, but it was kind of fun! I used a toothpick to do the trick. They turned out really cute, but I am not sure if I should call them cupcakes. They had more of a muffin texture. They were moist and dense, not light and fluffy like I was hoping. They were still really good, just not what I was going for. Preheat oven to 350 degrees. Spray a mini muffin tin. In a medium bowl, whisk together flour, sugar, baking powder, baking soda, and salt. With a toothpick swirl in the Nutella, about a ½ teaspoon each. Bake until a toothpick inserted in center of a cupcake comes out clean, 10 to 15 minutes. Remove cupcakes from pan; cool completely on a wire rack. This looks like the absolute perfect breakfast, or lunch or justa snack. SO delicious, I bet its wonderful with the nutella! Haha, I’m right there with you … put sweets in my path and I’m in trouble!! Ha, and I would defintely be in trouble with those, that sound like a perfect combination. Definitely a good splurging choice! It sounds great, but I honestly have never (YET) had nutella!! Am I nuts, or should I just stay away? O wow, your cuppies look sooo cute and tasty too!!! So cute–and they look so delicious! 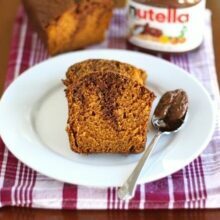 Recipegirl-I can’t believe you haven’t had Nutella! You must try it, but be careful, it is dangerous..ha! Wow, those look so good!! I’ve never had Nutella either but these might be worth a shot. ohh. i just adore nutella, the combo of nutella and banana is just classic and wonderful! these look fabulous! and since they are mini it is okay to enjoy, right? Great idea, Maria! They looks so pretty. I really need to try Nutella! They look gorgeous, Maria!!! Sorry you weren’t a fan of the cupcake part… I actually thought I’d like to try a different cupcake recipe with these as well, but realized I failed to write that in my blog post! Eek! Sorry!!! Either way, they look SOOO GOOD! Not only cute, but I’ll bet delicious as well. Nutella is a favorite here. These look so adorable and delicious! Love the swirl. YUM!!! Nutella is SO good!!! I love anything with Nutella – these look amazing! I’m going to try your whole wheat pizza dough recipe this weekend and I’m already looking forward to it! Yum. I have been a little obsessed with banana muffins lately, so I will have to try this out. These sound and look so good. I love nutella too and best way to eat it is by the spoonful! Did you see Closet Cooking earlier in the week? Kevin featured an open faced Nutella/Banana sandwich that looked beautiful! Teanna-Thanks again for the inspiration! Love your blog! Kerstin-Good luck with the pizza. Let me know how it goes! Oh, what a treat! These cupcakes look wonderful! Banana and nutella…now there’s a match made in heaven! wow. Giada has this nutella recipe where she puts a spoonful in some wonton wrappers and fries them. I’ve seen her do it twice, and both times I was gripping the couch, screaming “OH!!! YES!!!!! OH GOD YES!!! !” at the television. You could throw in some walnuts and make these into a variation on the banana chip muffins. Bet you $5 you could sell them – people would love to buy something other than chocolate! They look great and I’m all about the banana as well as LOVE Nutella. Sorry it wasn’t totally what you wanted, but Nutella seems to be better when it’s not baked into things–just in my opinion. Still–delish! in my book. Maria, these cupcakes are beutiful, I can not resist! MacDuff-I have seen her make those fried raviolis. I want to make those as well! Thanks for the ideas! Katrina-They were good, just not the cupcake texture/flavor I was going for. I should of known the bananas would make it more moist/dense. Oh well. Still a good treat! Cookie Pie-Thanks for the link. I will check them out! I’ve made the nutella swirled cupcakes before and they were delicious. Making a nutella swirl with banana cupcakes sounds even better. I love the mins. Love bananas and I love Nutella. What a great looking muffin! Wow jus tthe thought of having one of those delicous nutelle cupcake makes me drool. This would be great in like a little mini-loaf version (to keep the cuteness factor going!). 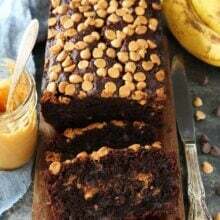 I just posted a banana bread today too – but I’m jealous cause mine certainly doesn’t have nutella! I think I’ve told you that Josh LOVES nutella- these would be his idea of heaven! I will have to keep them in mind for a special occasion! Thos elook fantastic, I love Nutella! is it OK if i add you to my blogroll? I have never tried Nutella…have heard all about it, but have never tasted it. I think your muffins/cupcakes look so good. I have to agree with the sweet issue..I have to get them out of the house fast. I love to bake so it’s a problem! those look tasty even to this non-banana person! You had me at Nutella…oh my. These look awesome!! mini, so you can eat more. you won’t believe this, but I have yet to make anything with nutella (besides toast). Banana and nutella are so good together. I love those little muffin pan. It’s hard to resist and thing that pops out of them. 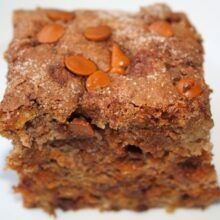 I have some overripe bananas to use up and these look amazing. I may have to indulge too! I’m on a nutella kick right now so this is perfect!! Oh, I love nutella! I eat it by the spoonful. 🙂 Mini cupcakes sounds great! I’m am still impressed. And hungry. I can’t be trusted with Nutella. I eat it with a spoon…until it’s gone and my tummy is hurting. These look so good!! Bananas + Nutella = Heaven! I love nutella and these look so good! nutella and bananas?? oooh my. I bought nutellsa for the first time this week when we went for groceries, now I can make these! Cannot go wrong with THAT flavor combination! I will think of them in muffins and bask in breakfast heaven! Awesome idea adding the Nutella. 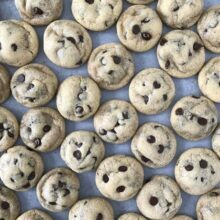 They look adorable and tasty!!!! I don’t have nutella because I eat it by the spoonful too! Maybe if you creamed the butter, they will taste more like a cupcake. Since the amount of butter to flour is essentially a cupcake recipe. ooohhh…nutella on banana cupcakes…sounds delicious! Yum! I had never thought of adding a Nutella swirl to muffins. Brilliant! 🙂 I’ve never been a huge fan of banana muffins, but that extra touch might just convert me. My daughter is eyeballing these and would love me to make them soon. They look so yummy! Two of my favorite things – Nutella nd banana cake. (If I could choose how I wanted to die, it would be with a spoon and as many jars of Nutella it would take to kill me). I love these! Oh good lord. Nutella is amazing. Coupled with bananas? Sinful! You know those sound & look fabulous. Love the idea of banana and nutella. I made those self frosting nutella cupcakes and was disappointed. Mine were on the dry side and not alot of flavor if you didn't have a bite of the nutella. Of course the cake top with all the nutella was wonderful! I'm gonna give this a try…I'm okay with muffins. I made ’em….they are amazing. Posted ’em on my site too…thank you so very much for this new fave of mine. I can’t wait to use it as my go to breakfast/ desert for guests! Where have I been. These look delicious!!! I ADORE the Nutella swirled in!!! Yum!! Loving the addition of nutella in this cupcake! i think that you should have the PRINT icon on plain sight, instead of hiding it! where the heck is the PRINT icon? These look amazingly yummy! The nutella swirl makes them absolutely irresistable!